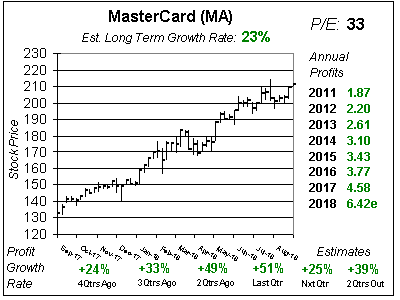 MasterCard (MA) is at All-Time highs as International growth continues to shine. Last qtr MA delivered 15% profit growth on 12% sales growth as Gross Dollar Volume was 14% Internationally, compared to just 9% in the US. International card adaptation gives the company growth opportunity, and technological advances with advanced payment types help spur growth. MasterCard’s Cash Passport will no doubt help International growth as it’s a multicurrency prepaid card that lets travelers load up to 7 currencies at a time. MA stock is a hidden gem for successful mutual funds. Managers know this stock is safe and can deliver mid-teens growth profit & stock growth. The Est. LTG is a robust 15% per year. The company consistently grows revenue each qtr, and that has helped profits increase every year since the stock went public (2006). Management pays a dividend of 1% and buys back around $1 billion in stock per qtr. And now a lower USD is helping profits, as the high dollar ate into profits in prior years. Overall this is a core holding for conservative investors, but the P/E of 30 is a little high and that’s the highest I remember ever being. MA is in my Conservative Portfolio and have it on the radar for the Growth Portfolio. Beautiful looking chart. But that red P/E of 30 sticks out like a sore thumb. Especially since profits just grew 15%. Analysts had estimated 8% growth. After MA reported profit estimates increased across the board with 2017’s going from $4.31 to $4.39. Qtrly profits Estimates for the next 4 qtrs are: 12%, 26%, 15% and 15%. This stock usually has a P/E between 25 and 28 and now its 30. I feel the stock could use a breather. My 2018 Fair Value is what the stock is selling for now. 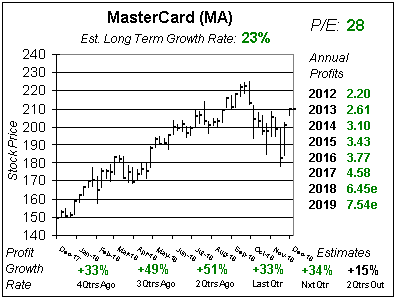 MasterCard has been incredible stock since it went public, and now with profit growth expecting to accelerate from 10% to 16% this year the stock’s been better than ever. This is one of the world’s best stock investments as it gives investors safety, a solid Est. LTG of 15% and a 1% yield. The company has grown profits in the double digits every year since it went public. MA ranks 9th of 32 stocks in the Conservative Growth Portfolio Power Rankings. I have it on the radar for the Growth Portfolio and it was a mistake not to buy it for this portfolio at lower levels.